Collecting the stories, photos and documents of Waipu people who served in the First World War and building a village exhibition. Our museum has embarked on further research into the lives of some of these individuals, and it is hoped that during the four years centenary of the war, the research will continue to build files of photographs, documents, and letters related to these individuals, their family details, their wartime experience, and what happened to them after the war if they survived. This research is already facilitating a re connection with many descendants of Waipu’s remarkable migration. 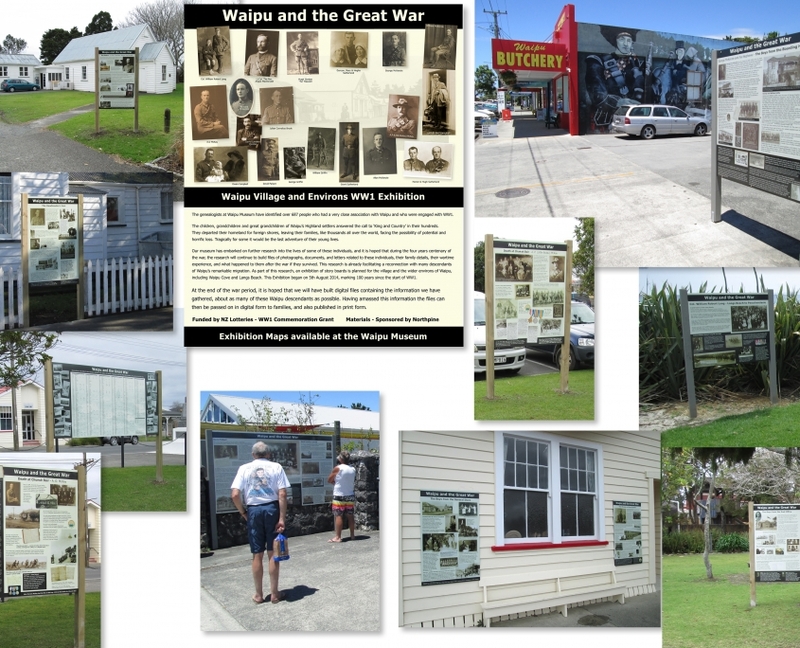 As part of this research, an exhibition of story boards has been erected for the village and the wider environs of Waipu, including Waipu Cove and Langs Beach. The Village exhibition opened on 5th August 2014, marking 100 years since the start of the First World War. At the end of the war period, it is hoped that we will have built digital files containing the information we have gathered, about as many of these Waipu descendants as possible. Having amassed this information the files can then be passed on in digital form to families, and also published in print form.